Fibromyalgia is a chronic pain condition that also features a host of other debilitating symptoms. Among these symptoms are diminished cognitive function, sensory sensitivity, headaches or migraines, and depression. Some of these symptoms can be attributed to central sensitization. What does this phrase mean? How may it lead you to a source of natural fibromyalgia help? Read on to learn about a cause of hope for those who are burdened by this chronic health ailment. Central sensitization is a condition where the body’s central nervous system goes into a perpetual state of windup without cause. In other words, the body kicks the senses and nerves into overdrive, something that is normally only done in response to imminent danger. When this occurs outside of the normal realm of an emergency situation, it can lead to allodynia and hyperalgesia. Once we explain what these two words mean, you will no doubt understand why researchers have connected fibromyalgia to central sensitization. Allodynia – Allodynia involves pain that occurs with little to no apparent stimuli. For example, has it ever felt like your hair hurts? We know it isn’t possible because there are no pain sensors there, and yet we feel it. Or maybe a loved one tries to caress your shoulder gently, but you suddenly feel a burning sensation and you have to pull away. Allodynia can be difficult to explain to someone who does not experience it and may even strain relationships. Hyperalgesia – Hyperalgesia involves an inordinate response to stimuli. For example, someone may bump into you with their shopping cart at the grocery store. That will be an uncomfortable experience for anyone. But for a person suffering from hyperalgesia, it may feel like they were shot or stabbed. This has become a more common term because of the rise in cases of opioid-induced hyperalgesia. However, for a fibromyalgia patient, this is just another symptom and not a side effect of a drug. Other sensory sensitivities may include an aversion to bright lights or glare. You may grow angry when you hear a repetitive sound, maybe even one that never used to bother you before. Strong smells, even ones that are natural, may be overwhelming. The result of all of these sensitivities can be mental fatigue to go along with the physical fatigue that accompanies constant pain. 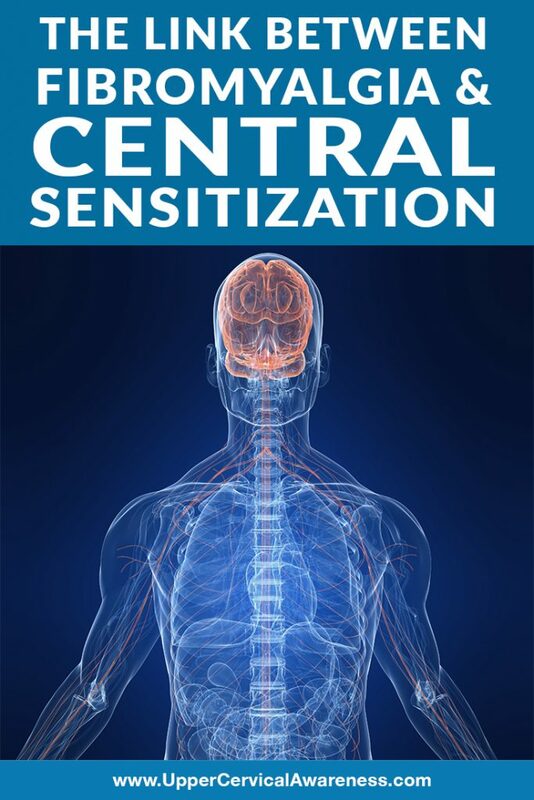 At this point, you may be wondering if you are suffering from central sensitization, does that just mean that fibromyalgia is all in your head? This is not true. The central nervous system involves more than just your mind. It is a complex network of nerves that travel throughout the entire body. These messages travel through the spinal cord and the brainstem. The signals being sent in the body are real. The pain is real. You are just feeling it in a stronger way. So the real question is, what could be causing your central nervous system to tell you there is more pain (or light or sound or smell) than there actually is? Rather than being in your head, there is some evidence that the genesis of fibromyalgia and central sensitization may be in your neck. The atlas surrounds and protects the brainstem. However, if this top bone in the spine becomes misaligned, it can put pressure on the brainstem. Since the brainstem controls many unconscious functions of the body, you can see how things may become confused, including signals that measure pain and report to the brain from the other senses. The cervical spine also facilitates proper blood flow to the brain. This is by means of tiny loops of bone that are only found on these vertebrae. They are called vertebral foramen, and they normally provide safe passage to the head for the vertebral arteries. Even slight misalignments, though, can kink the supply line and lead to certain parts of the brain receiving less oxygen. This can have a profound effect on the function of the nervous system as a whole. In fact, there are several cases studies where patients who were diagnosed with fibromyalgia also turned out to have atlas misalignments. After receiving gentle and precise upper cervical adjustments, the fibromyalgia was completely reversed within just a few months of care. Therefore, we would like to introduce anyone who is suffering from fibromyalgia to upper cervical chiropractic. If you suffer from fibromyalgia, you may also have an atlas misalignment, which could be contributing to or even causing many of your symptoms. These misalignments can occur during trauma, such as a car accident or a sports injury, and may work under the surface for many years before symptoms arise. However, things like poor posture and repetitive neck strain can also lead to misalignment, so it is worth getting checked out even if you have no history of injury. Since you are already in pain, you probably don’t want your neck popped or twisted. The good news is that since upper cervical chiropractors work in such a focused and precise region of the neck, we only use low force corrections. Gentle adjustments are long-lasting and can give the body the time it needs to heal from long-term damage. To learn more, schedule a consultation with an upper cervical chiropractor near you. You may find that this is the safe and effective way to get natural relief from your pain, and other symptoms.